Join us for our annual Art in the Wright Place art fair, housed in Frank Lloyd Wright's historic First Unitarian Society. The event features over 40 area artists and is a wonderful opportunity to purchase unique holiday gifts or something special for yourself. This sale features original art, including pottery, woodwork, fiber arts, jewelry, art glass, and more. 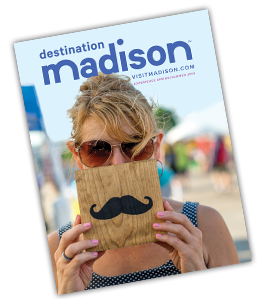 Sign up for the Greater Madison eNewsletter to receive special offers and information on upcoming events. Guide today or let us mail you one.